A reader in Brazil writes to observe that Ron Paul is very good at explaining his positions if he’s given adequate time to do so. Why not do it, then? Let people hear, from Dr. Paul’s own mouth, what he believes across a wide expanse of topics. The only way people are converted to his cause is by listening to him speak at length. Why not give them more such opportunities? I’ve watched your strategy to deal with the bias against Ron Paul. I totally agree with, but I’d go further. The problem is not only about foreign policy. Last week, I read someone say that, because Ron would cut the Education Dept., he only wants the rich to get college education and that he’s against any debt whatsoever. Until now, he hasn’t got any opportunity to explain his plans in details. When he goes to an interview, he’s usually interrupted, so he can’t explain what are the problems, what are their causes, what would be the consequences of not solving them right etc. I think his campaign should create something I’d call “The Ron Paul Lectures”. Ron would explain everything he wants in a positive way, not being interrupted, with as much details as he finds necessary. What can we learn about foreign policy from the Constitution? What is the foreign policy of the Founding Fathers? The pragmatic oposition to unnecessary wars: or, what is blowback? Why undeclared wars last so long? Are we safer right now? Get away from UN, NATO and the IMF! That’s, of course, just a suggestion list of lectures. Ron could record one a day, since those lectures should be short, 15 min. max. It’d be almost costless to make these lectures. All is needed is a website and a camera and Ron! Following your idea, other people could make videos corroborating his views. So, this would be my suggestion. I hope you embrace this idea and try to convince people of its value. You’re someone very respected by every one of us. I can’t do almost anything myself, but your voice can make people support this and, hopefully, make his campaign managers give attention to this simple and costless strategy. A lot of those things are addressed in Liberty Defined. Love your article. To read even more of where Ron Paul stands on any given issue, visit www.ronpaul2012.com He deserves the Nobel Peace Prize, not President Obama. When will the first of his "answers" be out? Hopefully this series will be done on U Tube or videos posted on his website so they can be shared in emails and social media sites. This is a fantastic idea since the debates hardly ask him any questions or adequate time to answer the one or two they do ask him and the news media usually does not portray him very well either. A huge supplemental to the lecture series mentioned above. Dr. Woods, I really like this idea and I think amending it with "Ron Paul Answers" as you suggest is perfect. Short, segmented clips of Dr. Pauls message would be very useful to helping spread his ideas. There already is an extensive set of lectures on where Dr. Paul stands on the issues, just pick up "Liberty Defined" on audiobook! One of the biggest problems when Ron Paul discusses 9/11 and foreign policy is that people make the mistake that Ron Paul's message "America's foreign policy of foreign intervention creates animosity and blowback that resulted in 9/11" means "America deserved 9/11 because it got involved in the foreign affairs of other nations". Using the phrase "Did America invite 9/11" is very harmful and is misleading concerning Ron Paul's position. 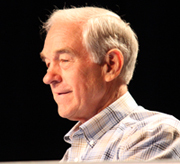 It seems Ron Paul should always preface his answers to 9/11 and foreign policy with something related to: "America did not deserve 9/11, but the cause of 9/11 was the misguided foreign policy of America's leaders of intervening in the affairs of Arab nations." GREAT IDEAS. TOO BAD NONE OF YOU STUPID AMERICANS THOUGHT OF THIS. His book "Liberty Defined" is the answers to the Answers suggestion. Get on CD.